Mafia movies are another hit-or-miss genre for me. I respect THE GODFATHER, but haven’t seen the trilogy seventy-eight times like some others have. Recently, PUBLIC ENEMIES was weak, but I’m not alone in saying so. I haven’t even seen SCARFACE (though I’ve owned it on DVD for a half dozen years). 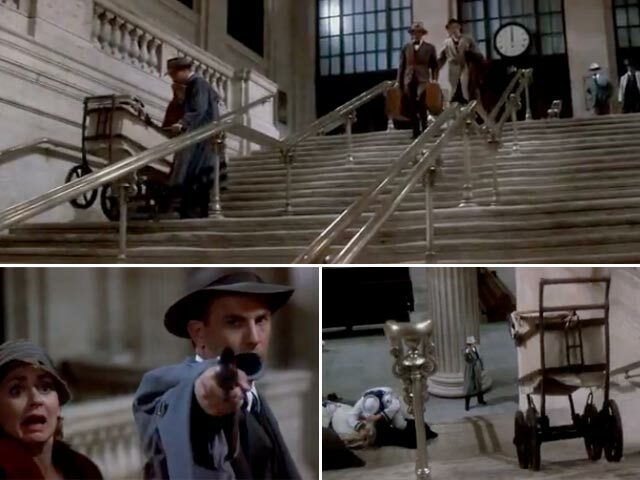 And another I hadn’t seen was THE UNTOUCHABLES. But I fixed that one, at least! So much of the Al Capone story is legend that it almost doesn’t matter what is true and what isn’t. This film certainly takes liberties with Eliot Ness (Kevin Costner) and his team of Untouchables (including Sean Connery and Andy Garcia) trying to take down Capone (Robert DeNiro). What are those liberties? Heck, I don’t even know. The story feels mostly legit. Some of the stuff with Ness and Capone meeting face to face probably never happened (that sort of thing rarely does), and the killing of one major character feels way too staged to be real. But, again, the film has an authentic feel to it thanks to Director Brian De Palma, so it gets away with quite a bit of posturing. The script which was (news to me) by David Mamet, is a surprising weak point. Of course, the dialogue is great. Mamet is incapable of writing bad dialogue. But the scenarios are uneven, and the focus is often… off. How many times did we need the accountant foreshadowing the tax evasion stuff? Why does the family time seem to be intentionally slow? Why does Malone chase that guy out of his house after preaching about shooting to kill and being willing to go that extra mile (I mean, “that’s the Chicago Way”)? The scene on the rooftop plays out as cheesy. Time and again the scenarios seemed to be unfocused, or second best ideas. Fortunately, the dialogue and the acting is so exceptional that it hides many of those glitches. And the acting IS great. It’s been sort of a drag to see DeNiro mired in junk the last several years. He should still be working with exceptional scripts and people all the time. Costner is himself, as is Connery, but they are cast very well, so it works. Their one-on-one scenes, both on the bridge when they first meet and later at a church, are among the film’s finest moments. Garcia gets to shine as well. Across the board, great acting. Sometimes De Palma’s direction of the extras and bit players feels very 50s in tone (i.e. when you get shot, you are to bulge your eyes in confusion, clutch your chest, and fall), but I put that on De Palma and not those extras. Good film. Looks absolutely gorgeous on Blu Ray. I love that this is a film from 87 that was about the 1930s, and on Blu Ray you’d probably guess it was shot anywhere between 1970 to 1995. There is a timelessness about it that is impressive. The bonus is for the set design. Chicago looks beautiful, and the 1930s are captured amazingly. This doesn’t ever feel like a set. It feels like Chicago. ~ by johnlink00 on February 3, 2011.